New legislation proposed in the California Senate would outlaw waivers that allow parents to exempt their children from receiving basic vaccinations for religious or personal reasons. The bill is a response to the latest measles outbreak in the state. The bill, announced Wednesday, would require all children to receive vaccinations prior to attending public school in the state. The proposal allows for exemptions only in cases where a preexisting medical condition would prevent a vaccination. Schools, meanwhile, would have to make their vaccination rates public. So far this year, at least 102 people across 14 different US states have contracted measles and are considered extremely contagious, according to the US Centers for Disease Control and Prevention. Most of the cases this year are linked to several dozen non-vaccinated people exposed to measlesat Disneylandin Anaheim, California. 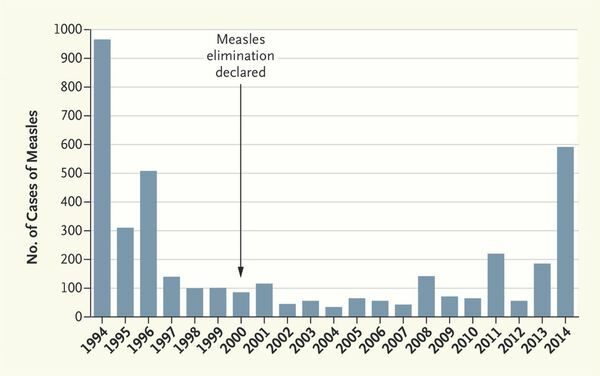 In the US, California was hit the hardest by measles last year and has not fared better in 2015. Nearly 100 cases of measles have been reported in the state in just the last two months, which is more than the entire nation normally sees in a year. 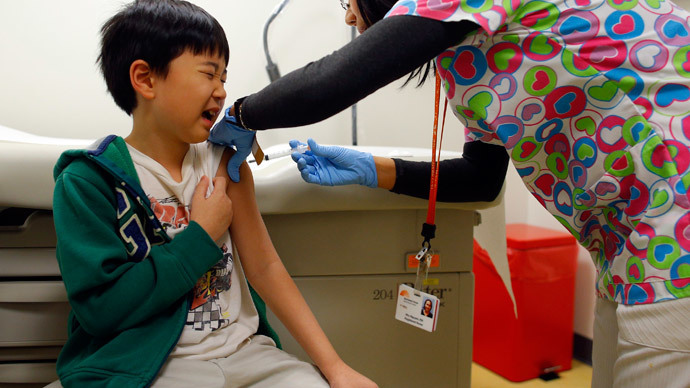 READ MORE: Viral debate: Is measles-vaccination America’s new political issue? A spokesman for California Gov. Jerry Brown told the Los Angeles Times that Brown is open to supporting the bill. Brown "believes that vaccinations are profoundly important and a major public health benefit, and any bill that reaches his desk will be closely considered,” Evan Westrup said. The LA Times reported that California currently has 13,592 kindergarten students with vaccination waivers on the basis of parents’ personal beliefs. Of those, 2,764 of those were based on religious beliefs, according to state health data. The bill’s authors said not enough Californians are being vaccinated for preventable diseases, and that the anti-vaccine movement – partly stirred by discredited links between vaccines and autism – has created substantial concern among parents who do have their children vaccinated. "We should not wait for more children to sicken or die before we act,” said state Sen. Richard Pan, one of the authors of the legislation, at a news briefing on Wednesday. "As a pediatrician I have personally witnessed children suffering lifelong injury or death from vaccine-preventable infection," Pan added in a statement. California’s US Sens. Barbara Boxer and Dianne Feinstein wrote to the state’s health department on Wednesday, calling for heightened vaccine standards. "We think that under your leadership, California can change this practice and reassure families that all children are safe at schools, daycare centers, and in other public places," the pair wrote. Matthew B. McReynolds of the Pacific Justice Institute, a parental rights and religious freedom advocacy group, said that scrapping the vaccination exemptions may be an overreach by the state that violates personal choice. “It's concerning to me that the measles outbreak seems to have prompted some hysteria,” he told the LA Times. “This seems like a pretty sweeping approach to what really is a very limited problem that could be addressed in other ways." Sen. Pan led an effort in recent years to require any parent or guardian seeking a personal-belief exemption to consult with a doctor regarding any risks of proceeding without a vaccine. The state demands a health-care professional sign-off on any such exemption. Gov. Brown supported the legislation, which went into effect in January 2014. Brown’s office said that since then, exemptions have decreased by nearly 20 percent, from 3.15 percent of children in the 2013-14 school year to 2.54 percent in 2014-15. According to the National Vaccine Information Center’s comprehensive nationwide legislative tracking, there have been 43 state-based legislative proposals concerning immunization filed thus far in 2015. NVIC says it “does not advocate for or against the use of vaccines,”according to its mission statement. NVIC is opposed to 33 of the 43 measures, including several child-vaccination mandates like California’s; parental vaccine-education efforts; eliminations or alterations for personal belief exemptions; statewide vaccine-tracking systems; and Human papillomavirus (HPV) vaccine offerings to minors without parental consent. The non-profit does support six proposals, including some that allow for more lenient exemptions rules for personal or religious beliefs and, in New Hampshire, one that mandates privacy protections within vaccine-tracking systems. The organization says it will “watch” four other state proposals.